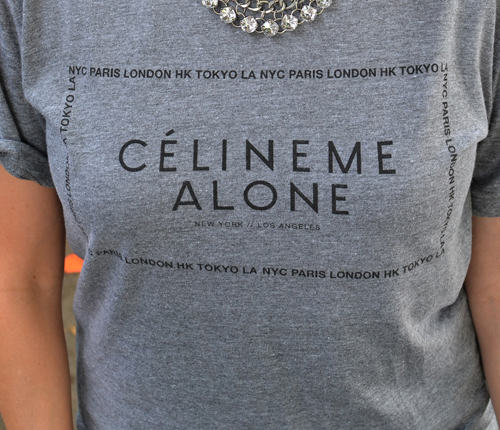 I've been searching for the perfect statement tee and it took me all of 30 seconds to order this "Céline Me Alone" one after seeing it on Nicole. Since I love dressing up a basic tee, I decided to pair it with my floor length silk skirt which doesn't get nearly as much use as it should. A sparkly statement necklace and simple black clutch were just the accessories I needed to complete my "casual glam" look. Love the shirt! I may need to purchase one as well! I have always loved that tee and the idea of dressing it up with a long skirt and statement necklace is just perfect! So cute. I love the tee and pairing it with a formal skirt is genius! The tee is so much fun! Love this look is versatile and comfy too, the necklace was the perfect finishing touch! You look amazing as always. Love the combo of the tee with the maxi skirt. Love how you dressed this tee up! The Maxi skirt is gorgeous on you! This look is perfect!! I absolutely love the maxi and the top together! This style is so "you" Audrey. Gorgeous + unexpected + casually chic. On another note, I really hope life is treating you well right now. I adore the daddy/daughter moment in your earlier post. She is getting to be so big! Look at those eyes! Honestly the tee shirt/necklace combo is so good. Love that you styled them with a maxi skirt! YAY! I bought that tee after Nicole posted it on her blog! We can be TRIPLETS! =) You look gorge! I'm obsessed with this! That tee is great and would look good with everything! I love the long skirt with it. So pretty!